Is the presence of carbon monoxide CO of biological origin, in the early Earth atmosphere, plausible? - Would you estimate it to be a major or minor component? That brings another question: are there higher evolved lifeforms at present (or the last 1/2 billion years), that are capable of tolerating atmospheric CO? Yep, there was CO in the pre biotic atmosphere and there are groups of thinkers who consider this may have been the core prebiotic reaction. 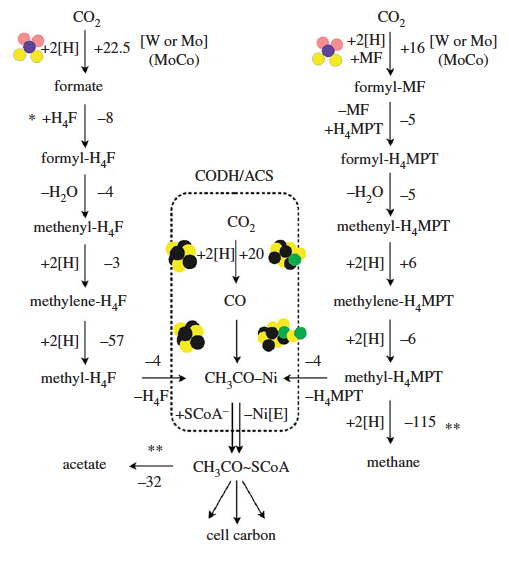 There are methanogens (not sure about acetogens) which are core to CO degradation/homeostasis today. My leaning towards CO2 comes from the massive bulk supply which was present in the early earth atmosphere. 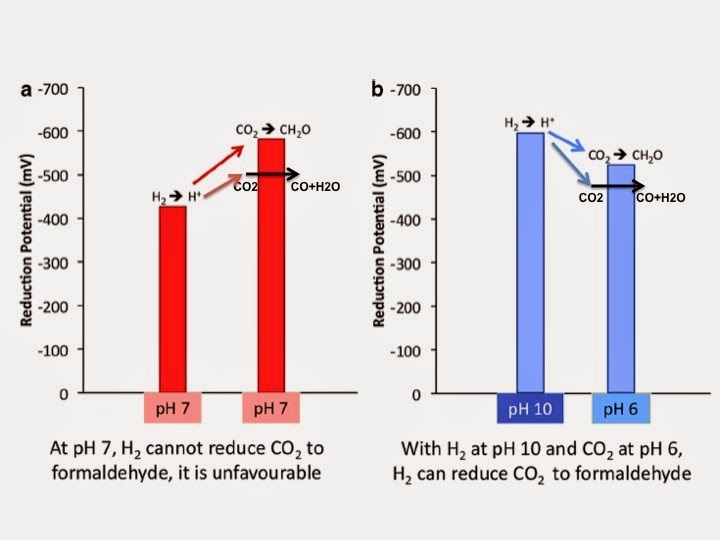 But whether CO was the spark which ignited metabolism which then produced conditions where CO2 reduction could be facilitated is interesting. There is nothing to suggest that CO2 reduction is anything but ancient and core to both archeal and eubacterial protometabolism. On the CO as origins idea, life could have originated anywhere with FeSNi minerals but only became confined to vents because they provide the environment for CO2 reduction. And a form of containment. I don't think any of the CO metabolising archea lack CO dehydrogenase, i.e. none have abandoned the fall back source of CO even if they are happy to metabolise it. Haven't checked this for certain but I think that's the case. I was coming to those thoughts from a different angle. Chemical potential gradient across a membrane or oceanic vents gradient, as the engine for life and driving evolution, is one possibility. Another possibility is photo-synthesis. 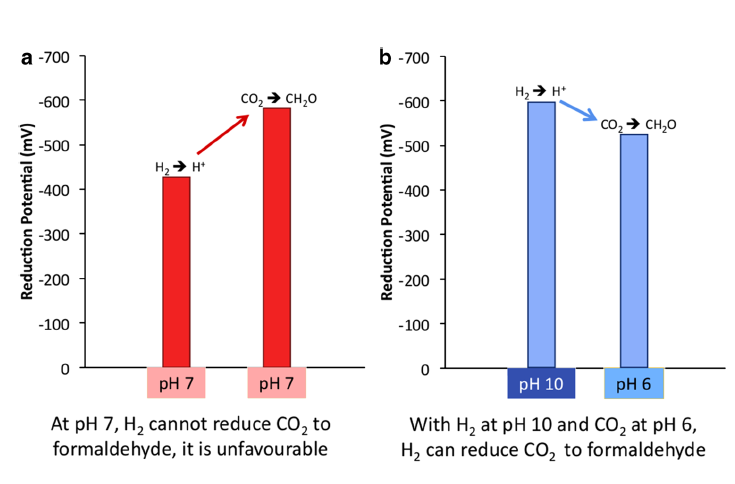 It does not have to be restricted only to breaking water into oxygen and hydrogen, it could also drive CO2-->CO + O, and it can also drive hydrocarbon and organic acids photo-dehydrogenation - which would directly plug into methanogenic life forms. BTW, a digression, did you read that "Chernobyl" study paper suggesting that melanin was used by early funghi and molds, as photo-synthetic catalyst, using gamma and other ionizing radiation instead of visible light? I was looking through some papers recently (my engineering research project), where the most promising photo-catalyst (for visible light) compounds that were investigated were iron and nickel-organic. Even metalic nickel seems to work. There are more papers but I can't find the refs at the moment. I was looking, as an engineering project, at various ways of producing hydrogen. Initially I thought of using water but realized that a much more promising route is dehydrogenation of hydrocarbons and fats because it avoids problems with catalysts destruction due to oxygen reactivity. Stan, I've been meaning to blog on the Chernobyl slime moulds since I read the press release and picked up a paper (or two?). 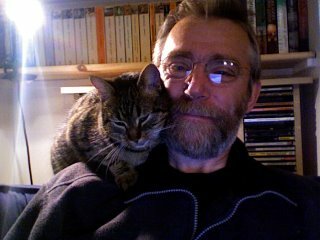 A few years ago now, isn't it? I'm guessing you've read much further than this, for me I stopped when it gave me the info I needed. 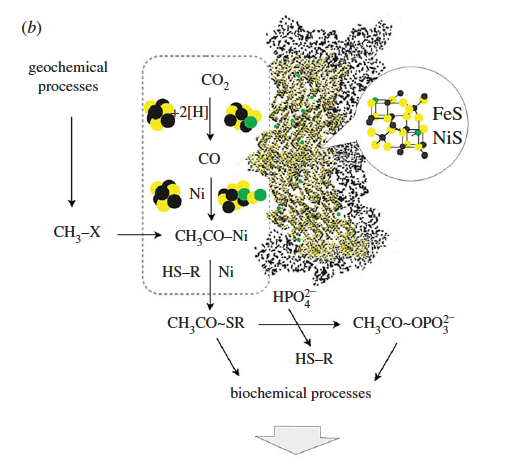 If CO production was photo driven it must have been completely replaced by reduced ferredoxin as the source of electrons for CO generation well before the separation of archaea from eubacteria because nothing seems to remain of its existence in the metabolism of either the methanogens or acetogens in the post. Getting a high energy molecule like CO from photosynthesis does not seem like something a LUCA would lightly (accidental pun) abandon completely... I agree that non oxygenic photosynthesis using low energy photons is common, I can't see how it is primal. Not sure what it was that had me currently thinking about Chernobyl and gamma ray "photosynthesis" unless it was the recent talk about aliens living on electricity etc. It's a very neat finding though! Peter I really hope you stay on this path........because our ideas are on a collision course. CO is a quantum gas that modern day free divers use in hypoxic environments. Your gut microbiota also makes 8-12 L of H2 a day when i is healthy and CO is in the gut without any O2. I find the idea of using external electricity to directly dislodge electrons in cellular processes fascinating, because it ties with some weird observations and even weirder speculations. It ties also with my pet theory that postulates that cellular membranes, (in some instances) may create a 2-D Bose-Einstein condensate of proton-electron pairs across the membranes, allowing a leverage of a 200mV potential by a very large factors! The reports and research on that is very incoherent and not very credible but it does exist. Did you look into it?